Leonie Bedet - Acupuncturist on Fraser St. offering personalized treatments. Leonie is a registered acupuncturist with the College of Traditional Chinese Medicine Practitioners and Acupuncturists of British Columbia. Leonie combines her passion for mind-body philosophy and holistic health by drawing on not only her training in Chinese Medicine but on her extensive background in diet and nutrition therapy and her ongoing practice of yoga. 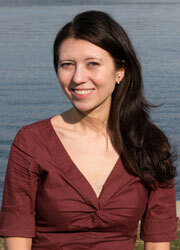 Leonie graduated from Pacific Rim College in Victoria, BC in 2011 with a Diploma in Acupuncture. She also completed her Yoga Teacher training at Yasodhara Ashram in the Kootenays of British Columbia in 2006. Leonie is a member in good standing of the Traditional Chinese Medicine Association of British Columbia. After an initial intake where past life history, current symptoms and concerns are discussed in a relaxed and supportive environment, Leonie will develop a personalized treatment plan towards optimal health and wellness using traditional Chinese medicine treatments. Leonie is continually adding to her health and wellness knowledge and techniques. Her lifelong commitment to this field makes her a valuable resource for her patients in every phase of their lives. **Most extended benefit plans offer coverage for Acupuncture. Contact your extended benefits provider to inquire about coverage details.